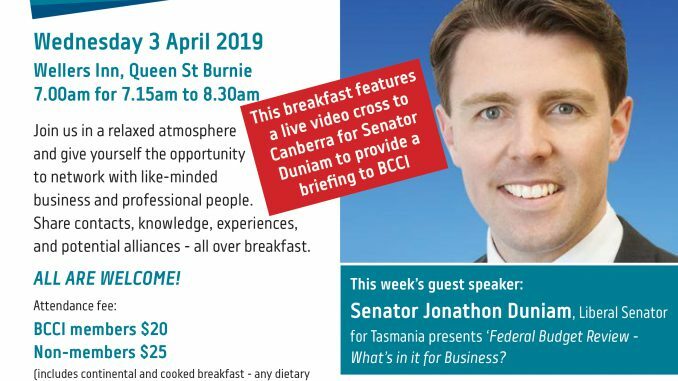 The Burnie Chamber of Commerce & Industry provides Burnie, and the coastal region, with a voice to advance and promote the commercial, development and economic interests of Burnie. Invitations to Events – The BCCI members are often asked to attend business forums and events. 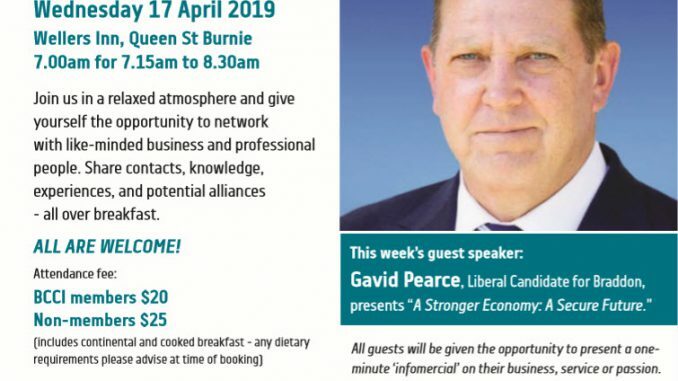 High Profile Guest Speakers – The BCCI enjoys high profile guest speakers at each annual dinner and quality topical speakers at our fortnightly breakfast networking sessions and occasionally at our monthly general meetings. Informative – At each meeting of the BCCI reports are given as to the activity within the commercial areas of the City, what is new and what issues are of concern. Input – As a representative or member you can express your view and participate in the decision making of the Chamber, including the recommendation of action or lobbying by the Chamber to local, state or federal government levels. Access to Information – BCCI (in conjunction with TCCI) presents regular seminars and training sessions relating to business operations, workplace health & safety and has a hotline to assist members in HR matters relating to the Fair Work Act. The BCCI usually meets on the 3rd Wednesday of each month. The meetings commence at 6pm and aim to conclude by 7.30 pm. The meetings are held in the Tom Wragg Board Room at The Burnie RSL Club, 36 Alexander Street, Burnie. Sometimes, for significant reasons, the meeting date and venue are changed. Due notice is given. The meetings are open to all members and representatives. The Executive Committee meets in addition to these meetings normally on the fourth Wednesday of each month or otherwise when the need arises. After each meeting a social drink and/or meal is had at the RSL Club. This provides for an excellent way to network. For further details call 0412 061501. These are held fortnightly at Weller’s Inn and feature continental breakfast items plus a hot dish. Members and guests assemble from 7:10am onwards and network before being seated at 7:30. All attendees get the opportunity to introduce themselves to the meeting then main course is served. Around 7:45 the guest speaker will be introduced and speak for 30 minutes and take questions until the meeting closes at 8:30. Cost is $20 for members and $25 for non members. It is not compulsory to attend meetings. Membership criteria is not dependent upon attendance. Like all organisations, the more you involve yourself the greater the benefit. Each member is emailed the minutes of each meeting for information, whether having attended or not. We welcome meeting attendance and would encourage you to do so, but appreciate that life, in particular in the world of business, is very busy. For further information or to discuss membership of the Chamber, please contact the Chamber.